Cooking can be a number of things. It could be your hobby, a responsibility you have to do at home, or an art form. And as someone who enjoys cooking a lot, I understand how it can be frustrating when problems in the kitchen arise. One of the common problems I always encounter in the kitchen is when food sticks to the pan which eventually leads to burning. When it burns, there is no turning back. What seems to be a perfect meal just simply goes down the drain like that. Fortunately, in this generation, there is almost a solution to everything. With this dilemma, gotham steel pan, a specific type of non-stick pans is here to save the day. In this article, I’ve rounded up the best gotham steel pans. This multi-function 4 piece set is created out of sturdy titanium and ceramic coating. This set comes with a variety of cookware such as a steam rack, a fry basket, and an induction base that is made out of stainless steel with a lid. The good thing about this set is that each comes with their own purpose. The steamer works best when you wanna cook veggies and you don’t want to risk losing its nutrients. The fry basket, on the other hand, allows you to drain off oil which may potentially risk your health in the long run. This is suitable for most medium except for induction cooktop. This particular frying pan seems to be one of the Gotham steel pans that deliver on the qualities that any typical Gotham steel pan boasts of. It has a powerful ability of having a non-stick coating assuring you that any of the dishes you cook will not stick to the surface. Its surface is also non scratch and can handle even a beating. Due to its ceramic structure, it is free from any chemicals that can potentially emit some harmful chemicals such as PTFE, PFOS, PFOA. But do take note that you have to season this pan before cooking. Proper seasoning is key to make the most out of non-stick coatings. One thing I did not like that much about this is that the handle is a bit hard to hold and grasp. This product is one of my top favorites considering that you almost get two products in one with this cookware. This device features a cookware with two sides. This device features both a grill and a griddle. Because of its double surface, this product is versatile. It can be used for baking or for cooking on the top of the stove top. Moreover, this device can also be used for outdoor grill plus it comes with a ridged surface that infuses your dish with a barbecue taste. This combo makes it a good fit for backyard barbecue parties with family. Moreover, the sides of this device come with grooves which makes it really easy to clean since the groove’s job is to catch the grease. Moreover, this device also has a high level of resistance against heat which lets you cook food much faster. This set comes with a variety of pans. Particularly, with two skillets – the first one is 8.5 inches while the second one is 10.5 and comes with a lid. It also comes with a lidded pot that has a size of 1.5 quarts, another lidded pot with a size of 2.5, a pot with a size of 5 quarts and lastly, a steamer with a size of 5 quarts. Just like the previous two, this set uses high quality and premium ceramic and titanium for its structure. As a result, you can cook using all the cookware it comes with, without having to use ingredients like oil or butter. It is also equipped with a surface that is resistant against scratch allowing you to use metallic utensils without the fear of scratching the surface of it. 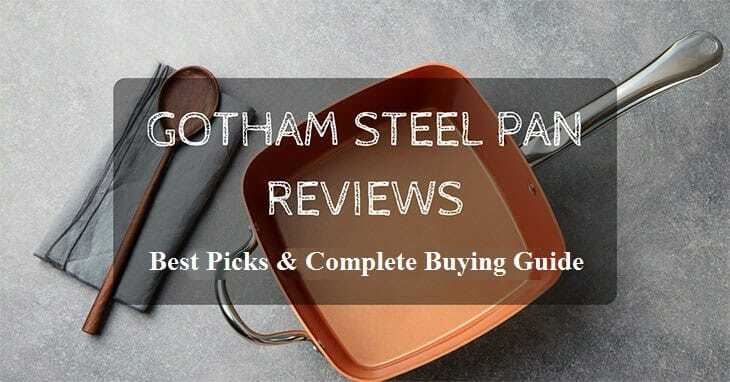 #Gotham steel pan #reviews- best 5 picks and a complete buying guide! This set is most fit for those that love to cook dishes with the use of deep frying methods such as some of the classics which include french fries and fried chicken. This is because this set comes with a square shaped 9.5 inches frying pan and a frying pan that comes in two sizes: 9.5 and 12.5 inches, a lid made out of tempered glass, a steamer tray, a fryer basket plus a recipe book. Every cookware this set comes with is made out of sturdy titanium and ceramic for its coating. Moreover, all of them can be used for cooking, baking and is compatible with stovetops.This is also resistant to rust and is free from any chemicals. 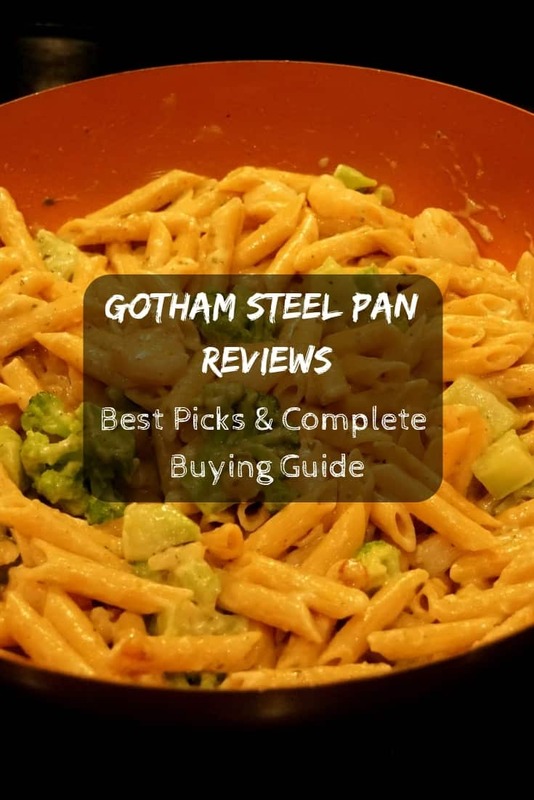 In this section, let us tackle what exactly is a gotham steel pan and why is there a hype around it. I have divided into different sections the reasons on why a gotham steel pan is different and special from others. Let us go over the basics, first, starting with the structure of a gotham steel pan. 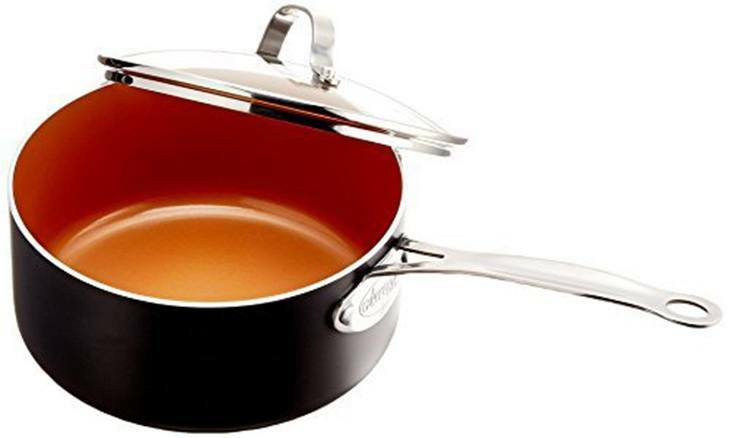 Gotham steel pan utilizes well-built titanium and combines it with a ceramic that is non-stick, together with a handle that is made out of stainless steel. The materials it is made of ensuring users many things. First, it assures you that you will not have to add some butter or pour some oil into the pan just to make sure your food will not stick because of its non-stick ceramic structure. On the other hand, the benefits of the titanium are that it helps to balance the weight of the pan. It makes the pan weigh lighter than other pans without compromising on the sturdiness. As stated before, gotham steel pans are created out of non-stick ceramic which means its coating does not stick to the food. However, more than just this, because of the titanium, gotham steel pans are also able to withstand over 500 degrees of heat. 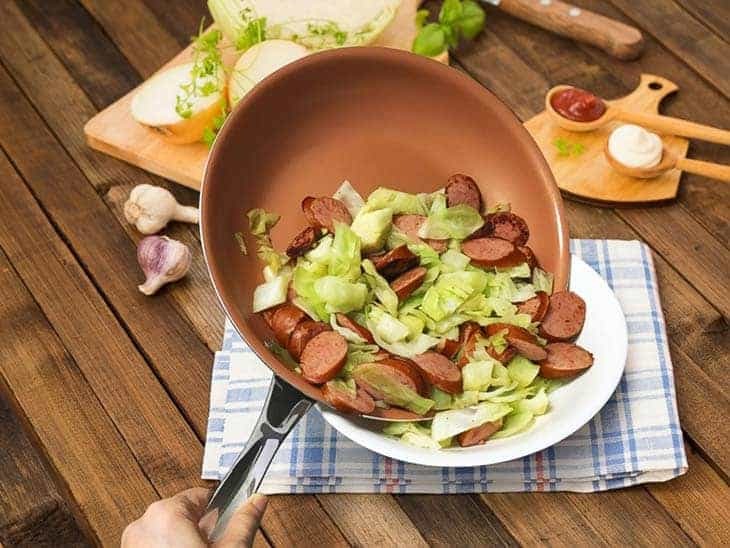 Its ability to resist temperature or withstand heat and its non-stick coating makes it the best type of pan for combatting possibilities of having burned food. 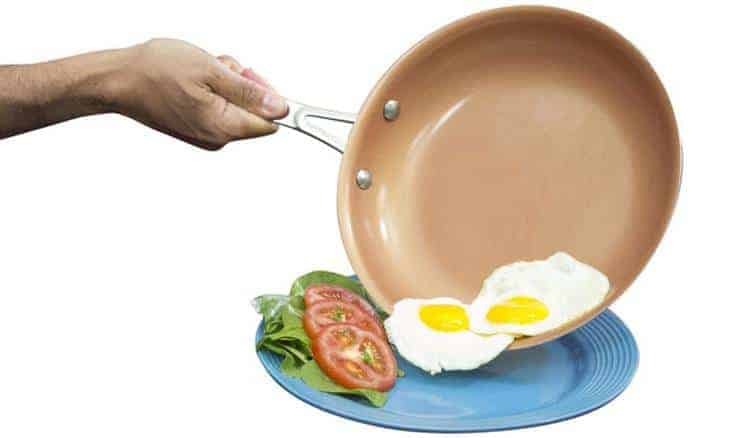 Polytetrafluoroethylene, PTE, or best known as Teflon is the most common substance used by several pan manufacturing companies to make sure that the coating of the pan will not stick to the food. Unfortunately, this chemical is not necessarily healthy as this a chemical which can trigger emission of certain toxic gasses or particles. Luckily, gotham steel pan manufacturers have come up with a way to ensure that the pans will have a non-stick coating without compromising on the safety of use. Typically, non-stick pans require a bit of maintaining. Thankfully, gotham steel pans are very easy to clean and maintain. You can simply place it inside a dishwasher or when not available, simply wipe it off with a paper towel. Manufactures have made certain that any other metallic made cleaning tools or even cookware will not be able to scratch the surface of the pan or harm its non-stick coating. This is probably the number one thing you should consider. All gotham steel pans come with good features such as its non-stick coating, sturdy titanium structure, and a heat resistant feature. Where they differ, however, is in the size and depth. One’s size is not necessarily better than the others but choosing size should depend on your needs and situation. If you have smaller stovetops, then a gotham steel pan with a smaller size is more fit for you. As for the depth or thickness, this largely depends on the usual dish you typically cook. If it involves large size dishes then a thicker gotham steel pan is more fit for you. This factor is really for maintenance purposes. It can be hard to clean a cookware without the use of a dishwasher. Consider your situation when choosing based on this factor. If you are the type that does not really have the time to scrub pans then getting a gotham steel pan that is dishwasher safe is a better fit for you. Handles may seem like a small thing but this is still something you have to consider carefully. The handles that work best are those that come in thick sizes and riveted. Riveted handles are ideal because you still have to tighten non-riveted handles from time to time. Take note that riveted handles will require thorough cleaning though as dirt can easily build up in the fasteners. You should also consider getting hollow handles as they do not conduct heat. This assures you that you will not get burnt. The winner for this roundup will have to be the Gotham Steel Titanium Ceramic 9.5” Non-Stick Copper Deep Square Frying Pan 4 Piece Set. The one quality I super loved about this was its versatility. Each piece comes with its own unique purpose. The recipe book can serve as a guide. The steam is for vegetables. The fry basket is so that you can drain off excess oil. This set also comes with an induction base. Moreover, each cookware is made out of sturdy aluminum, titanium and a ceramic coating that equips it with a nonstick feature. You can also use a dishwasher to clean them plus it is free from any chemicals such as PTFE. As for its ability to withstand heat, it can reach up to 500 degrees. Are You Curious: What Does Taro Taste Like?